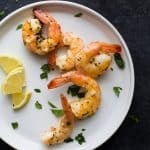 Easy 10 Minute Garlic Herb Roasted Shrimp served with a homemade Cocktail Sauce. These Roasted Shrimp are the ultimate Holiday Party Appetizer! So put that flavorless cocktail shrimp down and make these! I guarantee you’ll fall in love!